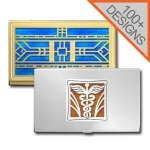 Showcase your interests with unique business card holders personalized with 100s of exclusive designs and gorgeous colors that make them subtly stand out. 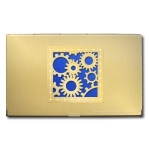 If you wish, you can even have these well-made metal business card cases engraved to add a special touch. 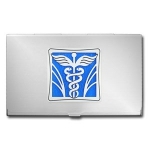 Find special engraved business card cases for men and women professionals featuring occupations, sports, animals, vehicles, flowers, monograms and so much more. 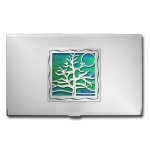 Each business card carrier, whether for the desk or your pocket, is expertly crafted with your selections for a creative expression of what's important to you. 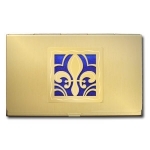 Personalized: Create a cool business card case with your custom choice of design, color, size & metal finish. We'll handcraft your card holder and ship within 1 - 2 business days. 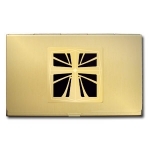 Engraved Cases: We offer in-house engraving services for fast, accurate custom engraving of corporate logos, monograms or award recognition gifts for men & women. Add an inspirational saying such as "May this business card carrier never be totally empty but full of prospects", a succes quote like "The secret for success in life is to be ready for opportunity when it comes.” – Benjamin Disraeli", or simply the recipient's name and title to give it that extra touch that makes your gift a standout. They say you should always 'dress to impress' - Kyle Design's original business card wallets are the perfect practical accessory for networking with colleagues and staying organized on the go. Shop our stylish business card carrier styles and sizes for a cool desk or pocket accessory that suits your personal taste. 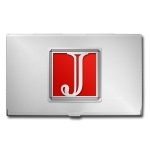 Thin Metal Card Case measures 3-5/8" x 2-1/4" x 3/16" D for holding about 10 business cards* or 3 credit cards. Perfectly sized to slide in a pocket, this trendy travel case is super slim and lightweight at 1.3 oz. (black cases weigh approximately 1.9 ounces) and also doubles as a sleek wallet - perfect for men and women who prefer to travel light, carrying only their ID and small amounts of cash or a few important credit cards. If you're relatively conservative in giving out your business cards, or you social network online via Facebook, Twitter, LinkedIn or Google Plus more often than face-to-face networking, this may be the perfect card organizer for you. Business Card Desk Display Stands are available in silver or gold metals or elegant black wood for a desktop accessory that's sure to garner notice from clients and co-workers alike. An attractive touch to your office desk, you can also place one at a reception desk in the lobby for an elegant way to greet and welcome customers. If you're a business owner looking for a "Thank You" gift for your employees, create a personalized business card stand gift to show them your appreciation for their work. 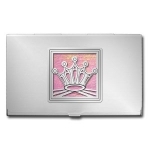 Whether you're a seasoned pro in your chosen profession or a recent college grad just getting your feet wet in the industry, a designer card holder from Kyle Design is a great tool to make your busy life a little easier while helping you to make a great impression on others. 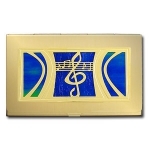 Versatile and stylish, each custom card carrier is handcrafted to order with your choice of gold, black or silver card case finish, gorgeous accent colors and artistic design for a gift that's both striking and functional. Kyle's signature design collection includes hundreds of inspirational images to choose from, so whether you're an athlete or dog lover, workaholic or free spirit, you can customize a unique card holder that reflects your personality. 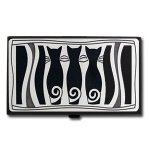 If you're a diehard animal lover, browse our cool animal business card cases adorned with your favorite dog, cat, horse and fish images. We also have fun wildlife designs with tigers, bears, deer, birds and more for those who prefer the wild side of animals. 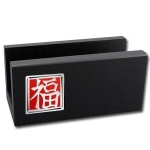 We've also got a creative collection of iconic business card wallets with heart patterns, Chinese characters, world designs and more that appeal to everyone. Don't have a set of business cards yet? No problem - for those still in school or putting their career on hold, personalized business card carriers are excellent for a multitude of other uses. 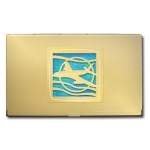 Customize a sleek card case for use as a durable wallet when you travel abroad, great for keeping your personal ID close and organizing foreign currency. 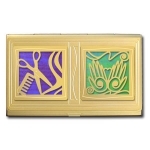 If your son or daughter landed an important summer internship, surprise him or her with a special double design card case adorned with their career design and a symbol for good luck or success. For the working mom on maternity leave (or dad on hiatus from work with paternity leave), keep a card carrier on hand to hold your personal "call me" cards when socializing with other new parents. Need to buy a gift for an acquaintance or co-worker you don't know very well? 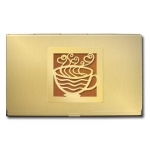 Try searching our selection of popular business card holders for a present that's sure to be a winner with anyone. You can also score points for originality with an elegant monogrammed card holder case customized with your recipient's initials. 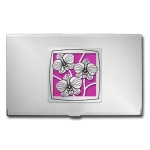 If shopping for a woman with chic tastes, impress her with our best selling designer business card cases for women featuring classy designs of iris flowers, butterflies, designer shoes and more. 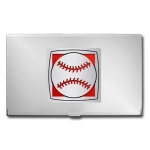 We've also got you covered when shopping for hard-to-buy-for men - distinctive business card holders for men designed with cool sports car, golf, poker and beer images that are sure to make him smile. For a gift that's truly unlike any other, have your personalized card holder custom engraved with a sentimental greeting or funny saying. We have a wonderful collection of popular business card case quotations covering a wide range of topics like life, love, friendship, health and knowledge - give your best wishes to a loved one with a heartfelt engraving message, or engrave an inspirational quote on your card case to keep yourself motivated. 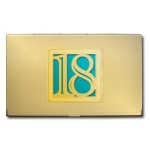 Every personalized business card holder case from Kyle Design is built to accommodate a universal range of popular business card sizes, since standard dimensions for business cards vary by country. In the United States and Canada, a standard business card measures 3.5" long by 2" wide. Unusual chubby business cards, measuring 3.5" tall by 2.5" wide, are also gaining popularity in North America. Japanese business cards (called "meishi") are larger, measure approximately 3.58" by 2.17" whereas other Asian business cards - such as those used in China and Singapore - have approximate measurements of 3.54" by 2.13". International business cards from Australia, Denmark, Sweden, Vietnam and Taiwan are similarly sized at 3.54" by 2.17". European business cards in the United Kingdom, Netherlands, France, Spain, Italy and Germany are smaller with approximate dimensions of 3.35" by 2.17". 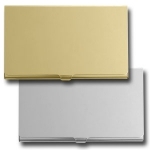 For more information on compatible business card dimensions, please see Kyle Design's business card case sizes and specifications.